As the fashion month has finished new projects come into schedule. Throughout the run up to High Street Fashion week on the blog every Wednesday, I'm introducing a new serial regarding pre fashion week interviews with brands to designers who showcasing at High Street Fashion Week amongst reviews on their latest collections and accessories. Here is the first post of the serial. This year EJMfashion is covering ‘ High Street Fashion Week 2013’ from the events within the boutique along with exclusive catwalk show however, it’s not just all about the blogs coverage of this celebratory event for the great British High Street you can get involved too. High Street Fashion Week 2013 is the UK’s favourite high street destination which features high street Womenswear, footwear, accessories, beauty, lingerie, and along with swimwear all under one roof. If you are attending this celebratory event for the high street throughout the three days there is so much to do! You can attend the pop up boutique style exhibition where, you can shop a variety of High Street brands amongst being a VIP at the High Street Couture Show. So what are you waiting for? You purchase tickets to attend the daytime pop up boutique on all three days (26-28th April 2013) and access to the catwalk VIP show finale. Whilst you have also got the option to become a VIP with gaining entrance to the pop up shop on all three days amongst, having access to the VIP catwalk show finale and along with a backstage pass. Where you can get a makeover done by a stylist who are a part of the shows backstage team whilst, receiving a gift bag. Not bad eh? The standard tickets are £25 each and the VIP ones are £35. 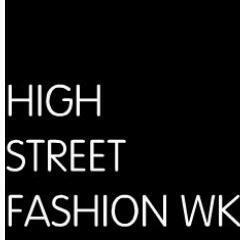 Find out more about High Street Fashion Week 2013 by clicking here… I will you see you!